Anyone else struggle with oily hair? It happens, and there’s nothing more frustrating than waking up after a nice and refreshing shower the night before, with oily hair. Don’t feel ashamed, natural oils in your hair is common and actually keeps your hair strong and healthy. But when it becomes too oily, we agree it can be annoying and hard to deal with. Here are a few tips to prevent greasy hair with enough oil to fry food. Are you guilty of constantly playing, touching, and fiddling with your hair throughout the day? Well, that might be a habit worth breaking if you don’t want oily hair. Your hands are already touching who knows how many things throughout the day and collects plenty of germs and oils that you don’t want to transfer onto your hair. To help from contributing to the oil build-up, try tying your hair in a bun to resist the temptations. If you’re in need of some bun inspiration, take a look at our Instagram or Facebook for styles we’ve done in the past! Although your hair may get a lot of oil buildup, it’s actually not the best thing to wash your hair every single day. Washing your hair more often than you should can produce more oil because it needs to make up for the oil that’s lost. Try to wash your hair two to four times a week. Your hair may stay oily at first, but with time your hair will get used to it and you’ll see amazing results. 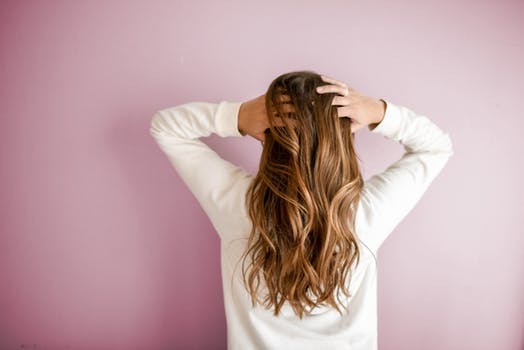 Many hair styling products contain oils and other ingredients that will only contribute to the oils already on your hair. Try to minimize your use of these products and be more aware of the ingredients in your products. And when you do use hair styling products, make sure to wash/rinse your hair at the end of the day. Dry shampoo has so many benefits, but one of the most obvious in this case is its ability to soak up the oils in your hair and make it look like you just washed even though you didn’t…because you’re on that two to four days a week wash cycle, right? Baby powder is also a good alternative to soaking up any excess oils, as well as adding texture and volume to your roots but make sure to use small amounts at a time and massage it in. Like we’ve stressed before, the foods you eat can affect your hair. Carbohydrates and processed foods can increase the oil produced in your hair. We know the temptation of your cravings can be a huge struggle sometimes but try not to include so many fried foods, sugar, or carbohydrates too often in your diet.